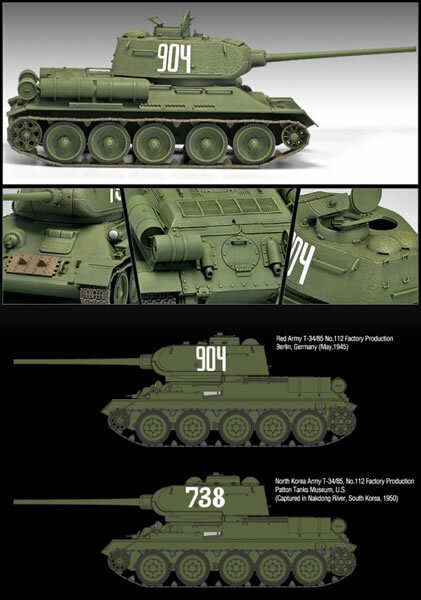 When World War II – the Great Patriotic War to the Soviets – came to an end, the Soviets continued the production of their late-war T-34-85 tanks through the end of 1946. While the main factory in Nizhniy Tagil (No. 183) began to shut down in preparation for starting production of the anticipated T-54 tank, Factories No. 112 (“Krasnoye Sormovo” in Gor’kiy) and 174 (Omsk) continued production. A total of 2,701 tanks were built - 493 at No. 183, 1,154 at No. 112, and 1,054 at No. 174. The tanks were nearly the same as the late war (1945) production but for ergonomic reasons of clearing the turret of propellant fumes early in 1946 the twin “Siamesed” ventilators at the back of the turret were split, with one being moved over the machine gun and cannon breech and one left at the rear of the turret roof. Also new for 1946 was a new taller cupola with a single piece hatch flap which replaced the lower cupola with the split hatch flaps. Other new modifications were made but most were internal and not outwardly visible. Until now the only way to get this particular arrangement - and then only with the Factory No. 112 “hard edge” turret - was to purchase an RPM conversion set that provided that turret and ventilator arrangement. 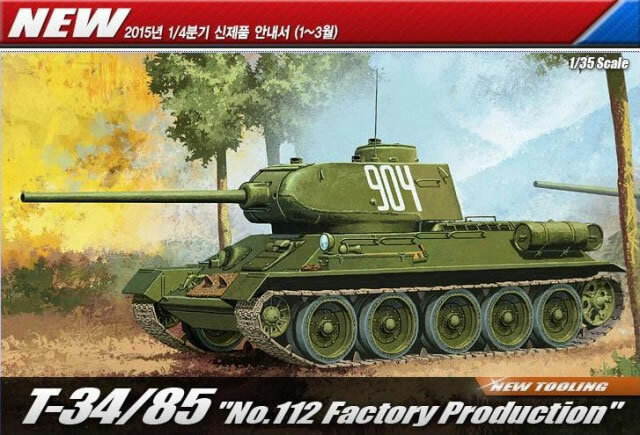 This new kit from Academy provides for it and also comes with parts to build either a 1945 or a 1946 model of the tank. The 1945 version comes with the twin ventilators and the low cupola; the 1946 ones provides the split ventilators and taller cupola. The kit also offers a choice between a solid radiator exhaust grille and an etched metal one, so those who do not like etch can go with the solid one. There is no interior per se, but it comes with suspension towers and spring units and a firewall between the fighting and engine compartments. The rear radiator exhaust grille also comes with the two louvers (for use with the etched grille) but all hatches except the transmission access hatch are molded closed. As it replicates Factory No. 112 it comes with the full set of “tankovyy desant” handrails around the upper perimeter of the hull. As they come on the same sprue with the ice cleats, you get extras in the kit. Six finishing options are provided, three for Model 1945s and three for Model 1946s; all are in 4BO Green. The 1945 options are: Red Army, Berlin, May 1945 (white 904); Red Army, Berlin, May 1945 (white m 08, red stars); Red Army, Yugoslavia Spring 1945 (white bear, “Ot Ottsa Shul’gn Syna Kisenko” - From the Father of Shul’gn to the Son of Kisenko). The 1946 options are: DPRK Army, captured at the Naktong River 1950 (white 738); DPRK Army, North Korea 1950 (white 229); DPRK Army, knocked out in Daejeon, ROK, 1950 (commemorative logo “Knocked out 20 July 1950 under the supervision of MajGen W.F. Dean”). A sheet of decals provides for all markings. Overall, T-34 fans may be a bit disappointed by the overdone casting finish and the ejection pin marks on the tracks as well as minimal etched metal. But for modelers short on time and who would like a late war ‘34 or Korean War version this is a nice simple build and will certainly look the part. 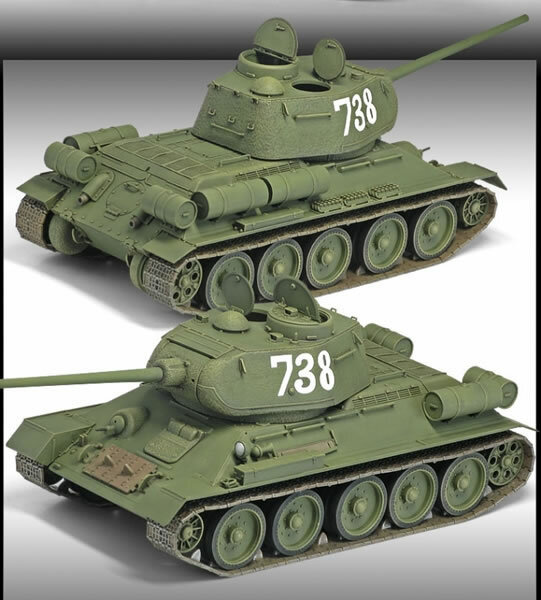 Sprue layouts also indicate more T-34 kits will be forthcoming.